The smartest way to purchase and make better spend decisions. 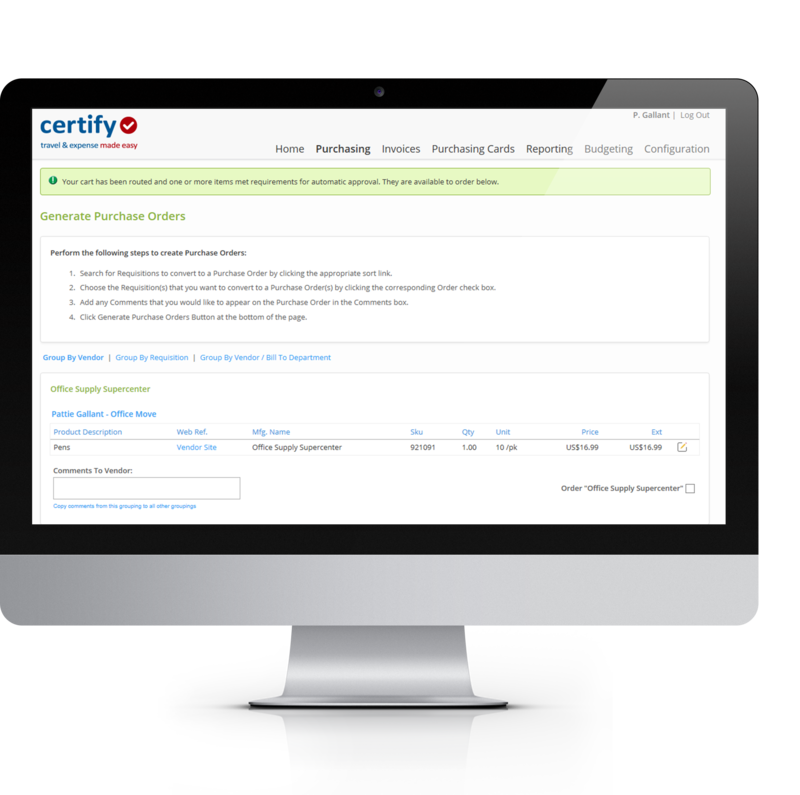 Certify Purchasing is a procure-to-pay solution that provides a customizable and efficient way to purchase and pay for goods and services. The entire process is digitized from requisition to your vendors through payment and integration into your ERP. Approvals are immediate, budgets are aligned—and POs, invoices and receipts are seamlessly matched. Begins a predetermined, customized approval process. Approvals are either automatic or routed to one or multi-level approvers. Sent for product fulfillment as soon as an approval takes place. Line items are additionally matched and automatically approved or sent for exception approval if discrepencies appear. Invoices are captured, matched with PO, and processed seamlessly. Once the matching and approvals are complete, an invoice goes into your ERP for immediate payment. Built-in controls adhere seamlessly to your organization’s regulatory requirements and approval workflows—driving compliance and keeping purchases within budget and policy. Future-proof your processes with digitally matched invoices, POs, and packing slips. Line items are additionally matched and, if discrepancies appear, sent for exception approval. Cross-check spending against budgets and track all orders, product delivery, and payments in an instant. Access real-time data and analytics via balance sheets, aging reports, and a full suite of reporting tools. Let the technology do the labor-intensive, manual work—and free your core teams to focus on building the business. Enjoy a complete spend management system that integrates across Certify Travel and Expense solutions and offers organization-wide data visibility. Want to see Certify Purchasing in action?